Sharpe was a part of the St. Ives Commonality of the Capellan Confederation and is located near Vestallas and Gei-Fu. Sharpe vanished from maps during the 3rd Succession War. At this time it was renamed Obeedah in an effort to hide Sharpe's existence and location. As one of the five Hidden Worlds it was used by the Word of Blake during the Jihad as a base from which to launch strikes against both the Capellan March and Sian. The planet also has some manufacturing capacity with many Blakist Combat Vehicles using parts seemingly from the Hidden world, parts having one of two serial numbers, OB1 or OB3, with testing indicating the parts vary only slightly but seem to originate from separate plants or facilities in that system. Jarvis Bolarugu would claim that while Obeedah had shipyards, they were "nothing fancy", but that the system had a formidable defense in the form of a very large space station, a component of Space Defense System style defensive system. Unlike Jardine or Mayadi, Obeedah would prove to be elusive to locate, in part due to the wildly changing borders of the Capellan Confederation since the collapse of the Star League, making it hard to know if it was even within the borders of the post-Jihad Confederation. Obeedah's supposedly large population, reportedly with a standard of living rivaling the Star League era, indicates that rather than a marginal world lost during the First Succession War that the future Obeedah was either the victim of a false cataclysm or a small disaster blown out of proportion by ComStar. On 29 November 2013, in a BattleTech forum post, Herbert A. Beas II revealed The Five as Odessa (Ruins of Gabriel), Herakleion (Jardine), Sharpe (Obeedah), Versailles (Taussen), and Tangerz (Mayadi). 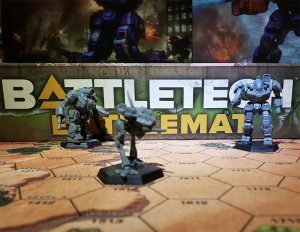 However, he also pointed out his role as BattleTech Line Developer was no longer effective, and that this therefore was not an official (canonical) ruling or verdict; new leadership might change the list in future published material. ↑ 9.0 9.1 Handbook: House Liao, p. 39, "Capellan Confederation after Second Succession War "
↑ 10.0 10.1 Handbook: House Liao, p. 40, "Capellan Confederation after Third Succession War "
↑ 17.0 17.1 17.2 Interstellar Players 3: Interstellar Expeditions, p. 22 "Hunting the Word - The Hidden Five - Mayadi"
↑ Field Report 2765: Capellan Confederation, p. 14, "Regimental Status"
This page was last edited on 31 October 2018, at 13:35.